This article is about the Medicine Buddha. For the Medicine King Bodhisattva, see Bhaishajyaraja. Bhaiṣajyaguru, formally Bhaiṣajya-guru-vaiḍūrya-prabhā-rāja ("King of Medicine Master and Lapis Lazuli Light"), is the Buddha of healing and medicine in Mahāyāna Buddhism. Commonly referred to as the "Medicine Buddha", he is described as a doctor who cures dukkha (suffering) using the medicine of his teachings. Bhaiṣajyaguru's original name and title was rāja (King), but Xuanzang translated it as Tathāgata (Buddha). 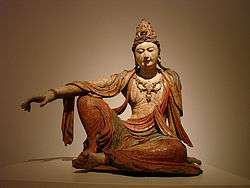 Subsequent translations and commentaries followed Xuanzang in describing him as a Buddha. The image of Bhaiṣajyaguru is usually expressed with a canonical Buddha-like form holding a gallipot and, in some versions, possessing blue skin. Though also considered to be a guardian of the East, in most cases Akshobhya is given that role. As an exceptional case, the honzon of "Kōya-san Kongōbu-ji" was changed from Akshobhya to Bhaiṣajyaguru. A Sanskrit manuscript of the Bhaiṣajya-guru-vaiḍūrya-prabhā-rāja Sūtra was among the texts attesting to the popularity of Bhaiṣajyaguru in the ancient northwest Indian kingdom of Gandhāra. The manuscripts in this find are dated before the 7th century, and are written in the upright Gupta script. The Chinese Buddhist monk Xuanzang visited a Mahāsāṃghika monastery at Bamiyan, Afghanistan, in the 7th century CE, and the site of this monastery has been rediscovered by archaeologists. Birchbark manuscript fragments from several Mahāyāna sūtras have been discovered at the site, including the Bhaiṣajya-guru-vaidūrya-prabha-rāja Sūtra (MS 2385). In the Bhaiṣajya-guru-vaiḍūrya-prabhā-rāja Sūtra, the Medicine Buddha is described as having entered into a state of samadhi called "Eliminating All the Suffering and Afflictions of Sentient Beings." From this samadhi state he spoke the Medicine Buddha Dharani. The last line of the dharani is used as Bhaisajyaguru's short form mantra. There are several other mantras for the Medicine Buddha as well that are used in different schools of Vajrayana Buddhism. Bhaiṣajyaguru is typically depicted seated, wearing the three robes of a Buddhist monk, holding a lapis-colored jar of medicine nectar in his left hand and the right hand resting on his right knee, holding the stem of the Aruna fruit or Myrobalan between thumb and forefinger. In the sutra, he is also described by his aura of lapis lazuli-colored light. In Chinese depictions, he is sometimes holding a pagoda, symbolising the ten thousand Buddhas of the three periods of time. He is also depicted standing on a Northern Wei stele from approximately 500 AD now housed in the Metropolitan Museum of Art, accompanied by his two attendants, Suryaprabha and Candraprabha. Within the halo are depicted the Seven Bhaiṣajyaguru Buddhas and seven apsaras. Chinese: 藥師琉璃光七佛本願功德經 (no. 168, two scrolls). The version translated by Yijing includes not only the vows of the Medicine Buddha but also the vows of the Seven Past Buddhas. Like Tibetan Buddhists, Chinese Buddhists recite the mantra of the Medicine Buddha to overcome mental, physical and spiritual sickness. The Bhaiṣajyaguruvaiḍūryaprabhārāja Sūtra, which the Medicine Buddha is associated with and described in great detail in, is a common sutra to recite in Chinese temples as well. Furthermore, much like the nianfo path of Amitabha, the name of Medicine Buddha is also recited for the benefit of being reborn in the Eastern Pure Lands, though this is deemphasized in favor of the Medicine Buddha's role for the living. 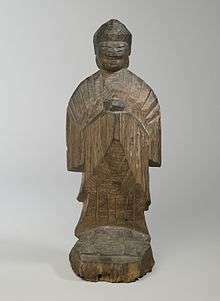 Yakushi (Bhaishajaguru, The Buddha of Healing) by Enkū (1628-95). Brooklyn Museum. Starting in the 7th century in Japan, Yakushi was prayed to in the place of Ashuku (Akshobhya). Some of Yakushi's role has been taken over by Jizō (Ksitigarbha), but Yakushi is still invoked in the traditional memorial services for the dead. Wherever this sutra circulates or wherever there are sentient beings who hold fast to the name of the Medicine Buddha [Yakushi Buddha] and respectfully make offerings to him, whether in villages, towns, kingdoms or in the wilderness, we [the Twelve Generals] will all protect them. We will release them from all suffering and calamities and see to it that all their wishes are fulfilled. ↑ Koya-san and Cultural assets. Retrieved 5 October 2015. ↑ Birnbaum, Raoul (2003). The Healing Buddha. p. 64. 1 2 "Schøyen Collection: Buddhism". Retrieved 23 June 2012. 1 2 3 Ven. Hsuan Jung. "Sutra of the Medicine Buddha" (PDF). Archived (PDF) from the original on 4 April 2007. Retrieved 2007-04-15. ↑ S. C. Bosch Reitz, "Trinity of the Buddha of Healing", Metropolitan Museum of Art Bulletin, Vol 19, No. 4 (Apr., 1924), pp. 86-91. ↑ CBETA, retrieved 2012. Main sutra page for Yi Jing Translation: www.cbeta.org/result/T14/T14n0451.htm, Scroll 1: www.cbeta.org/result/normal/T14/0451_001.htm, Scroll 2: www.cbeta.org/result/normal/T14/0451_002.htm. Dharmagupta translation: http://www.cbeta.org/result/normal/T14/0449_001.htm. Xuan Zang translation: http://www.cbeta.org/result/normal/T14/0450_001.htm. ↑ "Buddha of Medicine Bhaishajyaguru (Yaoshi fo)". Smarthistory at Khan Academy. Retrieved May 9, 2013.